Heavy Weapon may have come out on the Xbox Live Arcade over two years ago, but that doesn't mean you should ignore today's release on the PlayStation Network. Heavy Weapon is a arcade game from PopCap Games in which up to four players can cooperate to take down a huge number of on screen enemies. 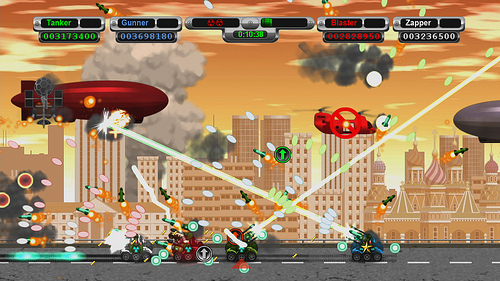 Players control a tank that they can upgrade with different weapons between levels. The on screen action is nothing short of chaos, but it's the kind of chaos that leaves you smiling when the dust settles. Heavy Weapon for the PlayStation Network supports four player local and online co-op, including drop-in and drop-out support. Page created in 0.9613 seconds.